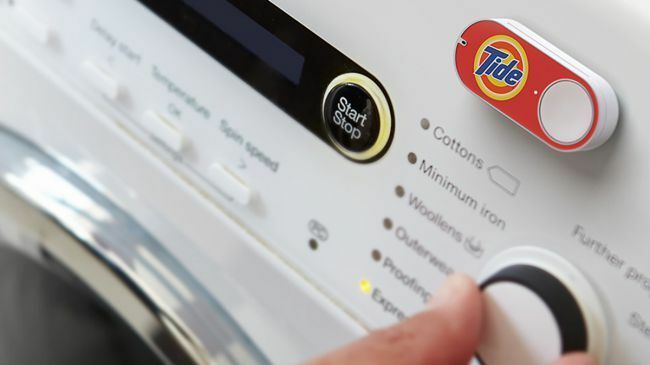 If you've not come across Amazon's Dash buttons before, they're simple internet-connected buttons linked to one particular product (like washing powder or coffee sachets). The idea is you tap the button when you're running low on something and Amazon delivers fresh stock right to your door. If Jeff Bezos happens to be reading, we've got a few interesting ideas about the ways in which these Amazon Dash buttons could be used - we're happy to wave all royalties for coming up with these innovative implementations of the technology in return for the extra convenience they'd bring. Over to you Jeff. Actually taking the trouble to shop for items and getting what you ordered is old hat these days: what about a Dash button that picks something from the virtual Amazon shelves at random? You might find yourself stuck with a completely useless bit of tat from time to time but we think the hits would outweigh the misses. Plus there's the whole sense of excitement from playing lucky dip (you remember those kids' parties, right) - setting up your preferred interests (e.g. video games, music) and price point limits would be fairly straightforward from Amazon's end, and you could then tap away whenever you wanted to be surprised... or needed a Secret Santa. Surely batteries are high on the list of stuff everyone runs out of on a regular basis: from television remote controllers to computer mice, plenty of gadgets and gizmos still require batteries as a power source. Being able to replenish stocks with a push of a button would be very handy indeed. You'd probably need different buttons for different types of battery of course. Even having rechargeable batteries in a lot of gadgets doesn't always help - we're forever misplacing our charging cable, so how about a Dash button for one of those too, Amazon? In the increasingly hectic, always-on modern age in which we live, it can be tricky to remember all those key events for family and friends throughout the year, let alone find time to actually hunt down the perfect gift. What about an Amazon Dash button for each of your loved ones that you can press whenever you're in need of an emergency present? The button could be tied to someone else's Amazon Wish List (with their permission) and that saves you the trouble of having to second guess what they'd actually like for a gift. You can even get same-day delivery in some parts of the world, of course. The last time you were staying at a hotel you might have taken the opportunity to order your breakfast the night before, and we'd be very interested in an Amazon Dash button that does the same job - save yourself some time and effort in the kitchen by getting piping hot scrambled eggs and bacon delivered to your door at 8am. And it's not such a far-fetched idea either: the rumours are that Amazon is already testing a takeaway food delivery service, and it could partner up with local restaurants eager to make some money from those people who aren't able to call in in person. If Amazon can save us a trip to the local cafe then perhaps it can save us a trip to the ATM as well - what about a secure cash delivery service for those times when you don't want to have to make a diversion to the cash machine on your next night out? Or those times when you owe the plumber but don't want to venture outside. Even better, Amazon could incorporate a currency exchange service into the system to save you a queue at the shops - the Post Office in fact already delivers foreign currency straight to your door, so it's not such a stretch to think Amazon might one day join in. Every knows the iPhone is one of the most in-demand gadgets there is, so why not a Dash button to get your order in as soon as possible? This isn't a button you're going to be using more than once a year but it's much more convenient than trying to navigate Apple's website while it struggles under the load of pre-orders. Amazon could even release limited edition buttons in advance of Apple events: as soon as Tim Cook unveils the new handset, fans have the chance to press a Dash button to confirm their order. Smaller, less important details such as price, colour and storage capacity can all be worked out later on. For sheer frustration, nothing beats running out of beer or wine halfway through a party or particularly significant sporting event. A Dash button linked to, say, a crate of cans of Kronenbourg 1664 could be a real lifesaver if you're entertaining friends and need to replenish stocks because the usual suspects turned up without their own beer. There are a few potential problems, however: tapping the magic alcohol button might become dangerously addictive after you've had a few, and delivery would need to be pretty quick for it to be of any use. Still, we can live in hope.